Strong world economy and recovery in buying by wealthy Chinese propel 25 per cent rise in fine-wine values in past 12 months but art market could prove even better performer if autumn sales are strong. Fine wine is now the best-performing collectible for the world’s wealthy collectors, with values having risen 25 per cent over the past 12 months, according to a new report. 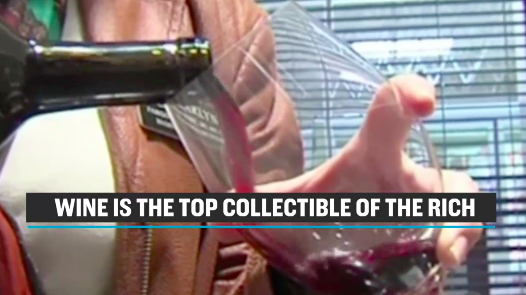 Wine is now the favorite collectible of the rich from CNBC. The Knight Frank Luxury Investment Index, which tracks the price growth in the major categories of collectibles, found that wine has replaced classic cars as the top collectible thanks to strength in Bordeaux, Burgundy and northern Italian wines. Collectible wine prices are up 61 per cent over the past five years. The surge follows a boom and bust in fine wines after the 2008 global financial crisis, when Chinese buying exploded and then cooled. Now that prices have stabilised and the Chinese economy remains strong, buying has picked up again. Wealthy Chinese are not only scooping up the fine wines, but they’ve also developed a taste for vineyards, snapping up over 100 chateaux in France ‘s Bordeaux region. But wine prices are also being driven by the strength of the economies in the United States, Europe and the rest of Asia. And Chinese buyers are becoming more expert buyers. Sotheby’s led the global wine auction market last year, with total sales up 22 per cent over 2015. Its sale of wines from the cellar of William Koch fetched US$22 million, and a 10-bottle lot of 1945 Chateau Mouton Rothschild went for US$343,000 – way above its US$120,000 estimate. At the same time, classic cars are taking a spill. After dominating the collectible list for years, with hair-raising price increases, classic-car prices grew only 2 per cent over the past 12 months, according to Knight Frank. They fell to sixth place on the ranking of collectibles. “I think cars are in for a period of flatter growth,” Shirley said. Art ranked second after wine, reporting growth of 7 per cent. Given the recent strength of the market and some important masterpieces expected to come up for sale in the autumn, art could end the year at the top spot.